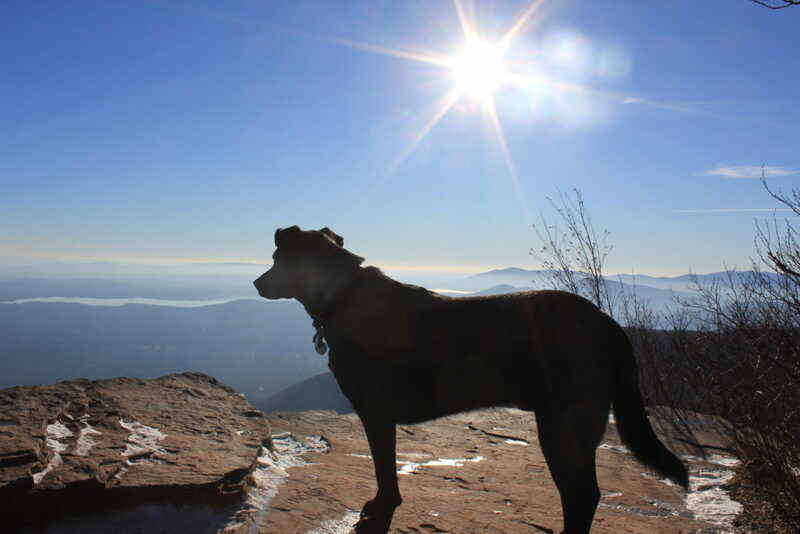 Overlook Mountain was one of the first hikes written about back in 2015 here on Upstate Dispatch, the second hike taken with Jeff Vincent of Catskill Mountain Wild. 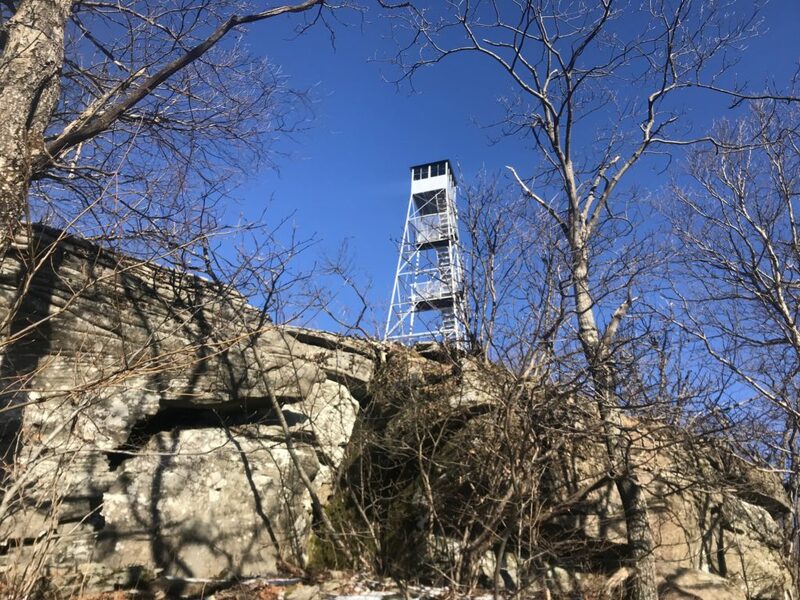 It’s a gateway hike for novices and visitors, because it’s relatively short, with extra bonus features, a fire tower, and magnificent panoramic views of the Hudson Valley and Eastern Catskill Mountains, the sort of hike that inspires us all to want to hike more of these mountains. The Fire Towers, built for early detection of forest fires, are a destination in themselves. The cabs at the top of the fire towers are closed on weekdays and in winter when they’re unmanned, but you can still climb the stairs almost all the way to the top if you’re not worried by the wooden floorboards that creak sharply underfoot in the freezing cold temperatures, or the whistling wind that rattles the metalwork. The first fire tower on the top of a mountain in New York State was placed at the summit of Balsam Lake Mountain in 1887. In the following thirty to fifty years, over a hundred fire towers were built. There are only five remaining: Hunter, Overlook, Red Hill, Mount Tremper and Balsam Lake Mountain. Overlook is the newest, having been built in 1950. NYNJ Trail Conference produces fire tower maps. Some avid hikers do all five in one day and, if you visit all five, in one day or whenever, you can get a commemorative patch to sew onto your hiking gear. Find more details of the existing fire towers here. The Overlook trail starts at the Overlook parking area on Meads Mountain Road across from the Buddhist Temple, just outside Woodstock. Due to the popularity of this hike, an additional parking area was added last year, on McDaniel Road, that is further on from the original parking area. New trails through the woods connect this new, larger parking area with the original trailhead. The original trail is a wide jeep trail, blazed red, much like Hunter Mountain and almost as steep, that continues for 1.9 miles. 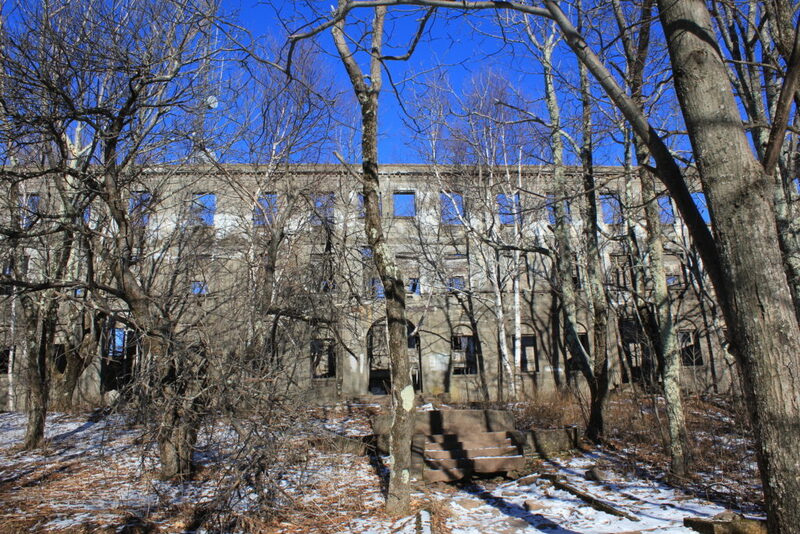 At 1.9 miles in, you’ll find the ruins of a massive abandoned hotel, and a smaller house behind it that may have been the housekeeper’s, whose once spectacular views are now overgrown. As Alf Evers wrote in his seminal work The Catskills From Wilderness to Woodstock: “from the day James Booth first thought of building a hotel on Overlook, ill luck had haunted every promoter of a hotel on the mountain”. There’s a whole, ten-page chapter in Ever’s 800-page book dedicated to The Overlook Mountain House in which the author writes about attempt after attempt to complete the hotel by successive businessmen, generals and stockholders. “Booth and William Scobie failed completely. To the amazement of everyone, rich Robert Livingston Pell had become insolvent, and then one of his sons died and the other committed suicide”. The hotel was not well-received when it first opened in 1871 because “drops of liquefied fog dripped from the hotel’s ceiling on opening day” and the design was underwhelming. The hotel subsequently burned down twice. After the second burning in 1921, the new hotel was built with concrete, but the developer ran out of money and gave up in 1940. Ironically, the concrete structure is now a permanent monument to history that might have completely disappeared had it been built in wood like nearly every other building in the region. Dazzling views – arguably the best in the Catskills – are now to be found at Overlook’s lookout, or its fire tower at the summit, near which you’ll find the very cute ranger’s cabin. There’s also a communications tower on Overlook that’s fenced off and off-limits. Rattlesnakes also live here, so unless you have a dog who is well-used to living with – smelling, hearing and avoiding – all the local wildlife, keep it harnessed and leashed. For a full map of the Overlook Mountain Wilderness, buy new 2018 Catskills Maps from the NYNJ Trail Conference here. This entry was posted in Hiking The Catskills on January 16, 2019 by JNUrbanski.